RIFT is the complete MMO experience you've been waiting for! Dynamic conflict and a revolutionary class system await you in this world besieged by the elemental planes. RIFT is now open to all users for its final beta event, Telara the Merciless, and The Escapist has a guild on two different servers with two different factions to show the world of Telara what we are made of! Since RIFT is now open to the public for their final beta event, we want to host an event on two different servers. 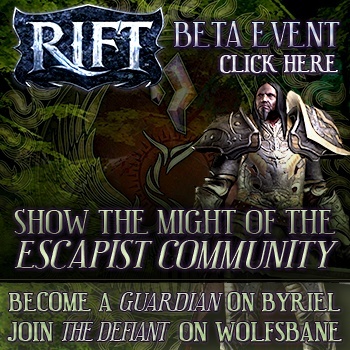 If you would like to play as a Guardian, head over to the Byriel server and get an invite into The Escapist Guild. For those of you who would like to play as the Defiant, jump on to the Wolfsbane server and get an invite into the Zero Punctuation Guild. Our goal is to have a lot of fun with our community, as well as show everyone in Telara our combined might! While you don't have to PvP, there is a way to flag ourselves, just in case we want to wreck shop across two different servers. Keep reading on the rules of participation and how to get your free RIFT account from Trion. This event begins today at 1PM ET and runs through February 21st at 1PM ET. For all the rules of participation and how to get yourself into the beta, click here. Grab your gear, it's time to wreck shop.